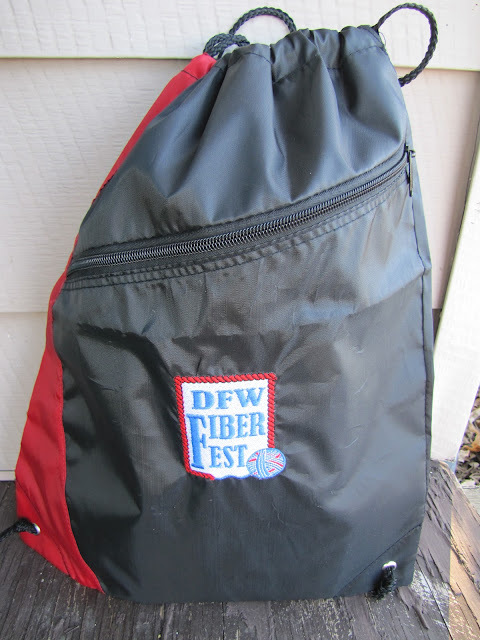 If you're in the DFW area, you might really enjoy the first class fiber event going on in Grapevine this weekend: The DFW Fiber Fest. President Anna Hulse (with mini mascot, Ike), has put together a wonderful event for knitters and spinners featuring lots of excellent vendors, top drawer national and local instructors, and admirable fundraising projects, all in one weekend. Her army of volunteers makes the details come together seamlessly. At least, I haven't heard about any seams showing. 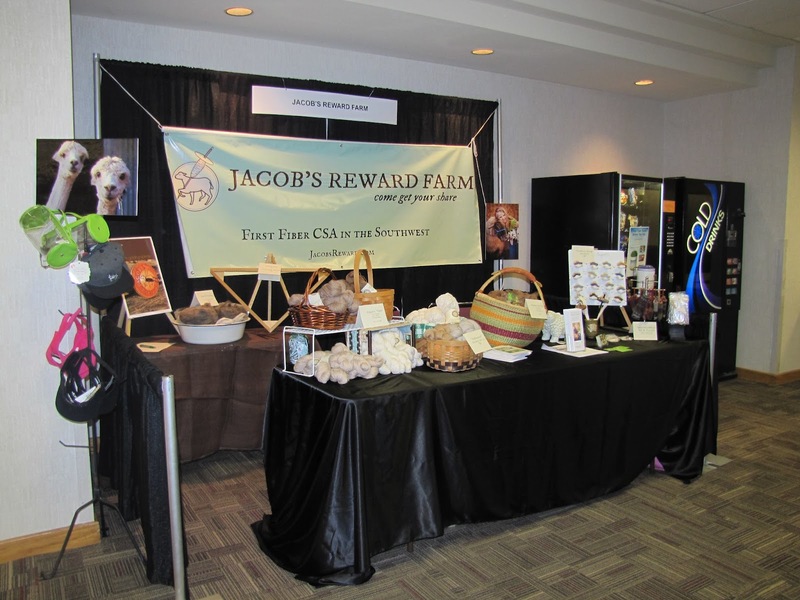 Just today, I saw hundreds of happy spinners and knitters come through the convention center, beaming from learning new things and nabbing great bargains on treasures. A busy home school family of knitters and crocheters takes in the sights, and takes some of the sights home with them. Brenda, one of my former tri-loom students, shows off a gorgeous piece of weaving she completed with her homespun yarns. We met so many wonderful friends today, and sent them home with yarns, rovings, sheep magnets and more. We're right by the food concession, so you can stop by on your way to grab a nice bite to eat. This evening, we were proud to help sponsor the Ravelry event, "Unraveling Ravelry," with speakers Mary-Heather and Sarah from our favorite knitting website. The place was packed. As much as I have loved and used Ravelry over the years, it seems there are whole truckloads of good stuff I have yet to plumb there. We learned how much the site changes and grows, with the help of user suggestions and updated technology. The power of this functional and aesthetically pleasing website is easy to underestimate. Take some time to poke around on Ravelry if it's been a while since you checked out the search features, or the new abilities we have to catalog our patterns, stash, libraries, etc. I looked down my row and spotted longtime friends of the farm, Dawn Bahr and Amy Semifero. Ravelry has brought so many of us knitters and spinners into friendship and community. Did I mention world-class instructors? My spindle hero, Abby Franquemont, is here at the festival, teaching all kinds of spinning classes I should have signed up for, but didn't. Thank the Lord she has them out on DVD, so all is not completely lost... I hope to get the chance to thank her for her book, "Respect the Spindle" which has helped me so much advance my spindling skills. Mary Heather visited with the hoi polloi after the presentation. She tells me that they won't be attending the Maryland Sheep and Wool Festival this year, which is where I usually run into them. It's been fun having them in our neck of the woods this time. Tomorrow is Day Two, of three, so I hope to spend a little time in the main vendor hall and get some more photos where the real action is. The trick is to watch your check book while you're in that huge room of temptation. No one is around when you need support to curb your stash enhancing. In fact, most folks are happy to encourage you to go ahead and pick up that amazing treat. After all, we deserve it, right?